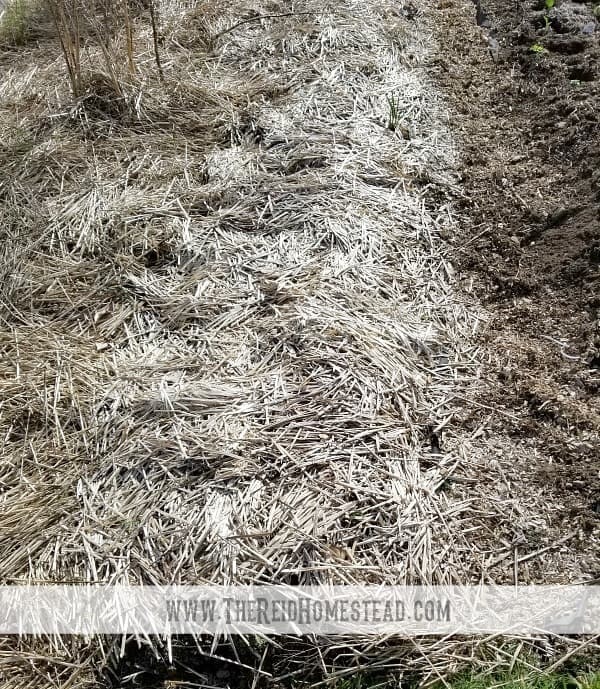 In this article, I will explain the secret to easy gardening, no weeding using straw mulch! Gardening should be fun and therapeutic. It shouldn’t be all work! If you are working that hard where it is not enjoyable, you are doing something wrong! Often times, the weeds take over, and that is when folks give up. What if I were to tell you a simple gardening secret? Mulch! 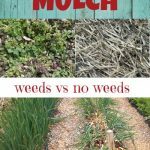 Mulch will prevent weeds, and benefit your plants in many ways as well! Use mulch for no weeding, it is the secret to easy gardening! Two rows in the garden in late winter/early spring. One row mulched, and one row not mulched. If you leave bare earth exposed, weed seeds will germinate. It is that simple really. Cover the earth, and they won’t! This is what I mean when I say mulch. A simple covering, that prevents light from reaching the dirt. If sunlight cannot be seen by the seeds, they will not germinate. Or only very few will. It is so much easier to remove a few weeds, than a jungle or forest of weeds, when there are too many to even count! 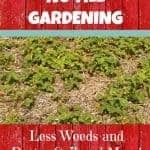 Mulching creates easy gardening, no weeds! Here is photographic proof! A section of the garden that was not mulched over the winter. A close up of a similar size area, that was mulched over the winter. No weeds! Garden row with thick straw mulch that was laid down early last fall, now at the end of winter. 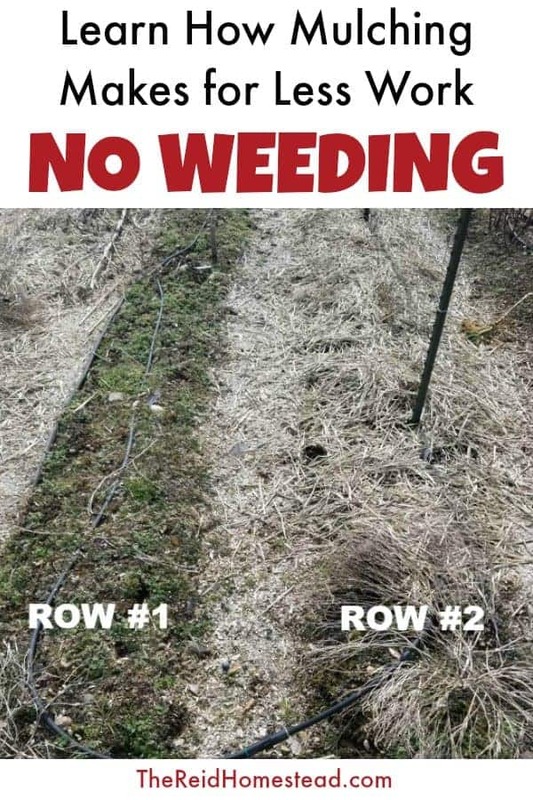 No weeds!This is the same row, with the straw removed. Only a few weeds! I can count only 5 in that photo! Another thing that creates a great many weeds, is rototilling. Yes, it breaks up the lovely dirt, but you know what else it does? Brings up a thousand million trillion little weed seeds! Exposes them all to the sunlight! Eeeek! 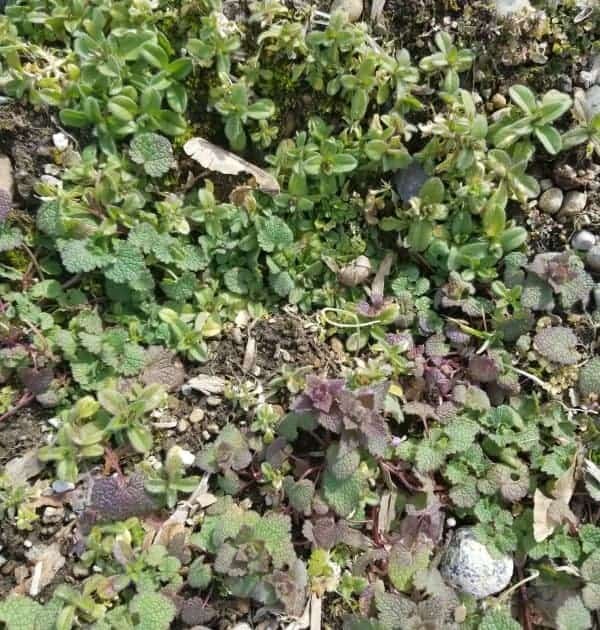 Many millions of baby weeds have just been born! So to get rid of the baby weeds, smother them with a layer of newspaper or cardboard first. Then lay the mulch on there thick! Don’t let the sunlight in! Rototilling also disturbs all of the lovely little micro-organisms in the soil. It dehydrates the soil, making the soil uninhabitable by these micro-organisms who prefer damp dark soil. 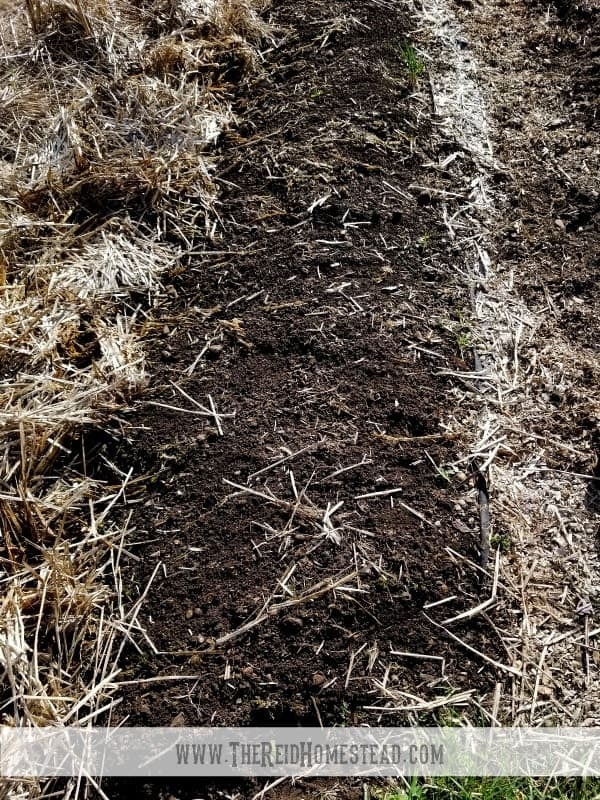 These methods of using layers, mulch and not rototilling, are also known as lasagna gardening, no till gardening and Back to Eden gardening. Layering on layers of mulch is a key factor in all of them. Layering the mulch, helps lesson the weeds, keeps the water in so less watering, and even more importantly, feeds the soil. 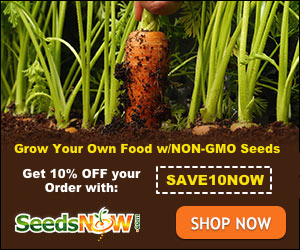 Ruth Stout and Lee Reich both have books on this subject of no till gardening. But Paul Gautschi, is the man himself, famed for his Back to Eden documentary on this subject. See video down below. You can really use almost anything as mulch, but ideally, it should be some form of organic matter that will decompose naturally. Not organic as in “certified organic” like fruits and veggies, but organic as in natural. 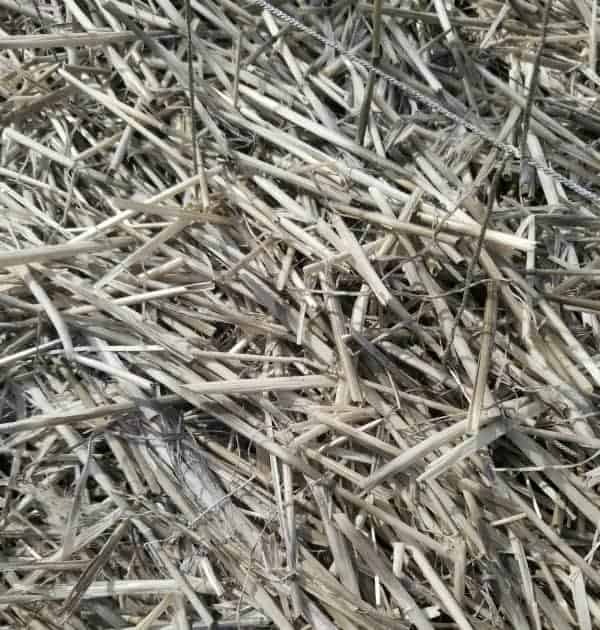 Straw, leaves, grass clippings, saw dust, wood shavings, bark, but most ideally, wood chips with green leafy bits chopped up with the wood chips. All of these natural things will decompose just as they are meant too. Straw is easy to come by and fairly cheap, which is why I use it when I don’t have wood chips on hand. One place to source these arborist wood chips are on www.chipdrop.com. Sign up and offer them $20 for a truck load. I have found when I don’t offer anything, I have gone as long as a year with no chips. As soon as I bump it up to $20, I usually get a load within a week or two. As the mulch decomposes, this draw worms and other little micro-organisms into the soil, breaking it up and leaving compost behind. Yes compost. Your mulch turns into compost! That’s why the leafy green bits shredded in with the wood chips make it the ideal mulch. Brown and green together for quick and successful composting. If your using a mainly all brown mulch, sprinkling with composted chicken manure is all you need to do to supplement it. But anything natural will eventually decompose and break down and then feed your plant! Ok, we already touched on how mulch smothers weeds, and feeds your plants over time as it breaks down. But mulch also keeps the water in the soil! Less watering! Less work. See what I mean? It really truly is the secret to less work in the garden. By providing a layer of insulation if you will, between the soil and the air, less water evaporates. Are you not sold on this concept yet? Many people get this far, are convinced that it all make sense, but then are not sure how to plant their garden. They are so used to rototilling every spring, what do they do now? Again, it is very simple. Brush away the mulch a little bit, until you get to the soil. Dig a hole in the soil, plant your seedlings, put the mulch back. Or, brush the mulch away to get to the soil, plant the seed. Once the seed germinates, push the mulch back. 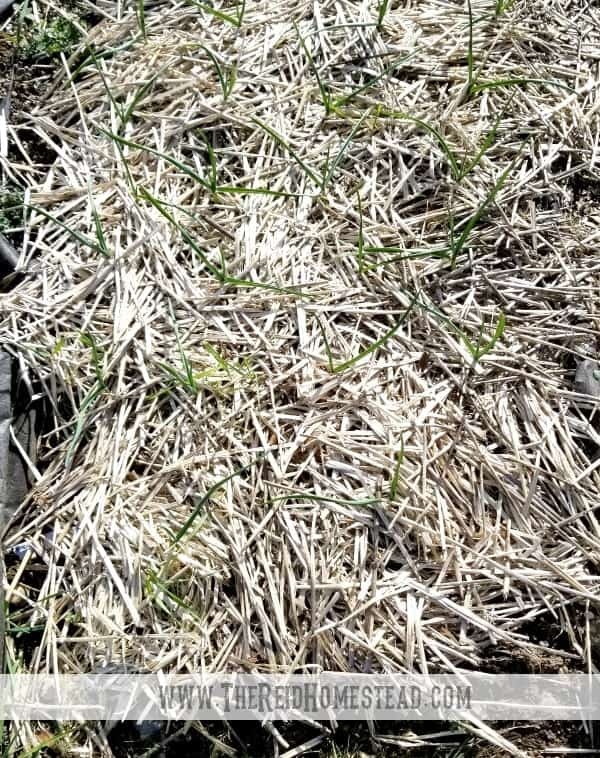 Garlic planted in fall and then mulched with straw. Only garlic, no weeds! The mulch will break down over time as it decomposes. It is important to continue to add layers of new mulch. I am still in the process of converting my entire garden to the Back to Eden method of gardening. Until I get enough wood chips on hand to complete that, I have been using straw as mulch. In the fall, I put a thick layer of straw down. I touch up where it is thin in the spring and I may even touch up again mid summer. If you are using wood chips, put 6-10″ at the beginning. Than add an inch or two each year. When starting the process of using mulch in the garden, you should begin with a layer of compost or aged manure as the base layer, than cover that with straw or wood chips or whatever else you are using. After that, a sprinkle of composted chicken manure at the start of the growing season should suffice. Do NOT mix the mulch into the soil. Mixing the mulch into the soil, or tilling it in, is not good at all. As the mulch breaks down, it will steal all the nitrogen from the soil. Using mulch and layer upon compost and more mulch without tilling, is called No Till gardening. So just continue to layer on top. Again and again. The first year is the trickiest, as the whole system is in the infancy of being developed, so you may need to add extra supplements. Ideally, you would want to start this gardening method in the fall, and let it sit and stew all winter long to get going. Before adding new mulch on for the season, layer any good organic matter you have lying around on first. Such as compost, grass clippings, aged chicken manure, fresh goat or rabbit poop or bedding. Adding these layers up over and over is called lasagna gardening. 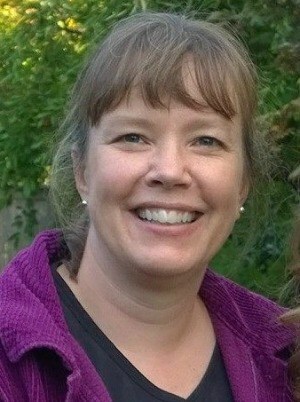 My friend Susan over at Learning and Yearning has this excellent article on Lasagna Gardening. Are you convinced yet? Does it make sense? Or seem too simple? This is what finally convinced me. This film, which is free to watch online. Please watch it if you have any doubts about it. I believe it is the key to the future of small scale farming. Now, a little disclosure here. Paul Gautschi is a religious man. It will come up throughout this film. However, if you are a gardener, please please watch it anyway if that turns you off. This film is so full of information that really is just good common sense. You will see, if you haven’t already come to understand, how mulch, no till and Back to Eden Gardening or Lasagna Gardening are the secrets to easy gardening, no weeds! If the film wasn’t enough, and you need more of Paul’s wisdom, or are curious how he does things in his garden, please check out L2Survive’s Video Channel on YouTube. He has filmed Paul numerous times. He has many video’s of Paul giving tours of his property, pruning lessons, talking about his chickens and how he uses them for fertilizer, how he grafts fruit trees, etc, etc etc. Please check out his channel and give him some love. I am so glad that someone is able to document all of Paul’s knowledge so it can be shared with the world! Please comment and let me know if you use this method of gardening and how it has worked for you. Or, let me know if you have been inspired to give this method a go! Happy Gardening! With Mulch!!!! HA! 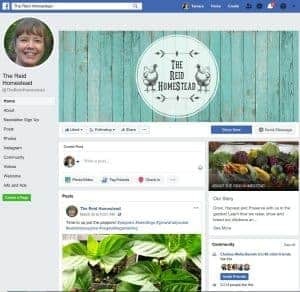 Please share this “The Secret to Easy Gardening, No Weeding!” article to your favorite gardening board on Pinterest! This will be SO HELPFUL with spring just around the corner. We spend sooo much time weeding, so I can’t wait to try this out! Hi Emily! Please let me know how it goes! Happy Gardening! Hi Christine! Thanks for stopping by! I hope you give it a try, it really does work! Happy Gardening! We’re finally getting with the program & will be mulching with sawdust this spring (tried leaves in the past but they blow away-like to the next county!). Mostly to retain moisture in our raised beds-it gets pretty windy here! I did the lasagna layering a few years ago & this year we’re having to move our beds. Let me tell ya, the soil coming out of those beds in phenomenal! Thanks for a great article! Hi Jessie, you should compost the leaves instead! I would be curious to hear how the sawdust works for you. Anything is better than nothing!!! Good luck with moving your beds and thanks for stopping by! I just watched Paul’s video. I have been moved! I have been a gardener for many years. Some good and some bad gardens have plagued my mind. I believe now this can work. I’m going to set up this all natural system in my yard. And of course, start small. I can always add to it, easily, with this method. Thank you for providing me this enlightening video. And thank you to Paul for bringing me back to earth and grounding me. Isn’t it an amazing film? I am so glad his knowledge has been documented! Good luck with your garden transformation! 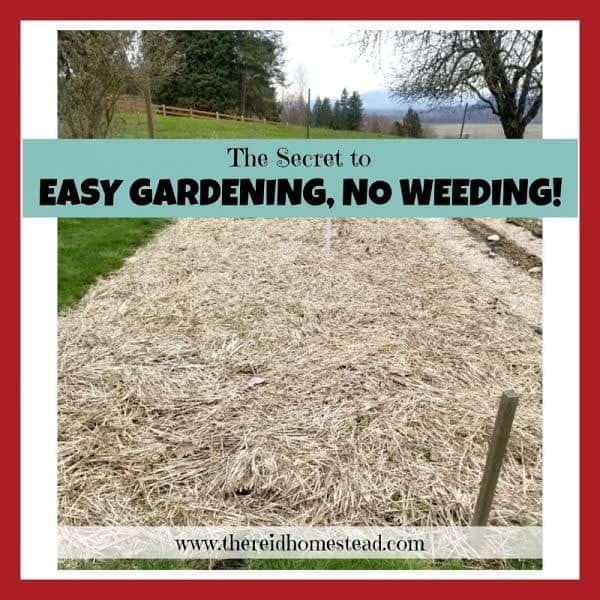 Hi Tamara, thank you for sharing this gardening method-and your obvious enthusiasm for it! I inherited my home from my grandparents, who both grew up on farms when the “wonders” of pesticides were thought to be a gift from the gardening gods. While the grounds of their estate reflect their love of gardening and hard-work, I have run into some unfortunate side-effects from the years of harsh chemicals use. I have decided to cover the contaminated earth (after watching my last harvest wither) with newspaper>compost>garden soil> mulch, and plant my garden in this top layer. In your opinion, Is it necessary to wait another year for the first layers of mulch to break down, or will my plan suffice in giving a few hearty ground covers a fresh place to thrive? I think in time, this should work for you. But when starting out a garden of this type, Paul suggests laying down the layers in the fall, letting it sit all winter, and then planting in the spring. When planting, you still need to get down into the earth below the woodchips (or whatever mulch you are using) to plant your seeds or transplants. You cannot only plant in the compost and mulch layer. The roots do need to get down into the soil below. However, you mention adding garden soil into the mix as well. I guess it would depend on how much you are adding? But yes, I think it will work for you if you plant in the soil, not the mulch. 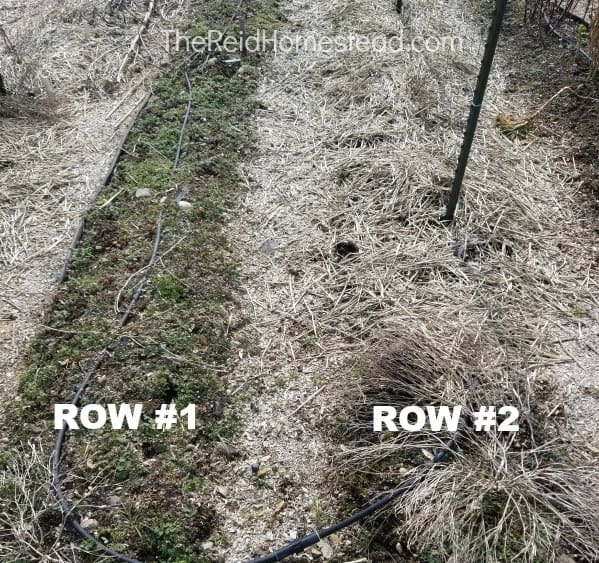 It may take some time for the system to break down enough and for the micro-organisms to do their good work and begin fixing the bad soil below. I know that I would be too impatient to wait another season….I say give it a go, it can only be better than your last season and I think it will continue to improve over time. Good luck!